Kerrisdale is south of Georgia and Burrard, on the West Side of the city of Vancouver. 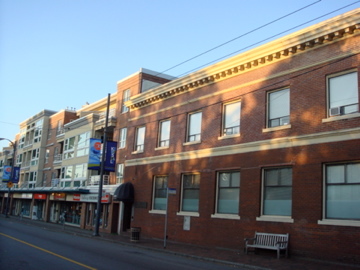 Kerrisdale Village is where the majority of the shops, restaurants and cafes are located. It includes the area along West 41st Avenue bounded by Larch Street to the west and Maple Street to the east. Kerrisdale Village also runs along West Boulevard between West 39th and West 42nd Avenues. Kerrisdale is a charming neighbourhood with it’s brick-paved sidewalks and welcoming spirit. It has a charming quaint village feel and is a great place to spend the afternoon. The people are friendly and there are many shops and cafes to explore. It is home to a number of senior citizens; however, while the neighbourhood is typically low key, there are a number of elementary and secondary schools in the area. If you have a dog, there is Kerrisdale Centennial Park located at West 43rd Avenue and Yew Street. If you don’t mind transferring, take the 17 Oak Northbound from the corner of Granville and Georgia to Oak Street and West 41st Avenue. Transfer to the 41 UBC going Westbound at West 41st Avenue and Oak Street, and get off at West 41st Avenue and West Boulevard. Thomas Hobbs Florist (2127 West 41st Avenue) – Truly the most exquisite flower arrangements in town! An institution in this neighbourhood for over 30 years. Hills of Kerrisdale (2125 West 41st Avenue) – If you are looking for trendy, high-quality fashions, look no further. Here you will find a plethora of designer clothing and accessories for both men and women. Hill’s has been open since 1914; you will get a sense of this from their beautiful antique store decor. FAB the Premium Denim Store (2305 West 41st Avenue) – Ladies, come here to find that elusive pair of perfect-fitting jeans. Offering designer jean brands such as Rock Revival and Mother Jeans, in addition to a wide range of trendy tops. Buchans Kerrisdale Stationary (2141 West 41st Avenue) – This quirky yet sophisticated stationary store will not disappoint. Offering a quality selection of writing instruments, basic art supplies, unique gift cards, journals etc. A great place to find a thoughtful last-minute gift! Cowboys and Angels Toy Store (2159 West 41st Avenue) – Toy store, portrait studio and ceramic studio all in one! Your kids can choose from a fun variety of toys, get their portrait taken, and paint their own ceramics all in one afternoon. Call the Kettle Black (2150 West 41st Avenue) – A kitchenware store with knowledgeable staff and high quality products. A must if you are passionate about cooking! Isola Bella (5692 Yew Street) – The highest quality clothing and shoes for children. Carrying designer brands such as Tartine et Chocolat, Antik Batik, Chicco and Oscar et Valentine. Jules and Eve (2009 West 41st Avenue) – Known as “The Dress Store” by many Vancouverites. Offering a quality selection of dresses, shoes and accessories for all occasions. Designer brands include Betsey Johnson, Cynthia Rowley, Lily & Jae and many more! Kerrisdale Cameras (2170 West 41st Avenue) – The knowledgeable staff will be happy to assist you with all of your camera needs. Offering a range of new and used equipment, in addition to photo finishing services. Pure Nail Bar (2267 West 41st Avenue) – Pamper yourself! Treat yourself to a manicure and pedicure done by one of their nail specialists. Walk-ins are welcome but you may want to book ahead. Simply Natural Raw Pet Food (5565 West Boulevard) – Offering natural raw pet food for both dogs and cats. The owner is very knowledgeable and helpful. The Velvet Room Boutique (2248 West 41st Avenue) – Be sure to visit this boutique for a comprehensive collection of stylish fashions by Canadian designers. Suvai (2279 West 41st Avenue) – This quaint French restaurant is the perfect place to take your date. The food is prepared with care and the wine selection is decent. Fish Cafe (2053 West 41st Avenue) – A must for the seafood lovers. Almost everything is made in-house, and the dishes are cooked in a home-style fashion with generous portions. Perfect for a quick yet gourmet meal. – Irashai Sushi (2260 West 41st Avenue) – Offering both raw and cooked Japanese cuisine. Fresh and well-prepared. Nando’s (2064 West 41st Avenue) – Delicious flame-grilled chicken served with a variety of sides. A casual atmosphere that is perfect for a family dinner. Order at the counter, take a seat and their friendly staff will bring the dishes to your table. The Mac Shack (5395 West Boulevard) – Gourmet mac n’ cheese that will please everyone from the kids to grandma and grandpa. The menu offers ten variations of this favourite dish, ranging from the basic classic to a lobster version. Mini Mac menu options are available for the little ones. Avenue Grill (2114 West 41st Avenue) – A neighbourhood landmark, Avenue Grill first opened its doors in 1927. Offering breakfast, lunch and dinner home-styled cooking. Adonia Tea House (2057 West 41st Avenue) – Exquisite high-tea service in this charming Victorian-style tea house. Everything is prepared from scratch and with a lot of love! Lunch items also available. The Secret Garden Tea Co. (5559 West Boulevard) – The most flavourful teas served with a selection of fine pastries, sandwiches and other lunch items. Don’t miss their high-tea service – reservations are required, and can be made for noon, 2:15pm and 4:30pm, every day of the week. Caffe Artigiano (2154 West 41st Avenue) – An Italian-style cafe offering quality espresso-based drinks prepared by well-trained baristas. Bean Bros (2179 West 41st Avenue) – Casual atmosphere with gourmet coffee and home-style food. Benton Brothers Fine Cheese (2104 West 41st Avenue) – A specialty cheese store offering a wide selection of quality cheeses, accompaniments, and charcuterie. Kerrisdale Community Centre (5851 West Boulevard) – Swimming pool, gym, library and a variety of classes for children, youth and adults. Kerrisdale Carnival Days takes place in at the end of April in Kerrisdale Village. There is a variety of entertainment including children’s rides, balloons, food, face painting, musicians, horse and carriage rides, a pooch poetry contest, a parade with marching bands and more. Kerrisdale Days Festival takes place at the end of August in Kerrisdale Village in celebration of the neighbourhood’s birthday. There is a variety of entertainment including clowns, face painting, balloons, horse and carriage rides, contests and more. Kerrisdale Farmer’s Market – Offered for the first time in 2011 as a trial, this farmers market ran from the first week of August to the first week of October. It was located on East Boulevard between 37th and 41st Avenue, across from Point Grey high school. They are hoping to bring it back for 2012.